Marietta Market is looking for a Market Manager for the 2015 season. We are accepting resumes until the end of March. Thank you to all applicants! We are excited to begin our sixth year! Marietta Market is seeking a Market Manager. This will be a part-time paid position, approximately 8 – 10 hours/week from May 23rd through the end of October, with some hours required during the rest of the year, primarily pre-season. ♪ Develop and maintain a system of recording daily market flow, health of financial transactions, and vendor attendance. Marietta Market loves kids!!! That’s why we’ve partnered with Heritage Creek Farm Camp to offer FREE children’s activities every FIRST Sunday of the month between the hours of 11am and 1pm. 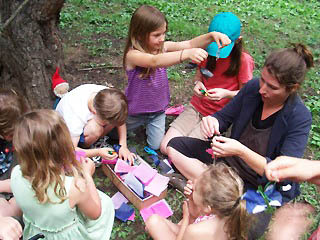 Bring the kiddos on down to participate in games, crafts, stories, or whatever fun things camp staff have up their sleeves that day! Children may even get to meet and greet some small furry animals, depending on the week! 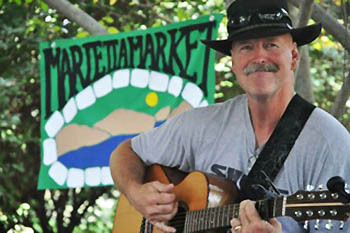 Marietta Market loves music! That’s why we invite local musicians to share their talents with market patrons and vendors alike! We typically schedule musicians between 11am-1pm to ensure weekly entertainment during peak market hours. While this is a volunteer opportunity, we encourage musicians to display a bucket or open instrument case in which to accept tips. Music is acoustic, presented in a laid-back style, and adds a unique element to the market experience. 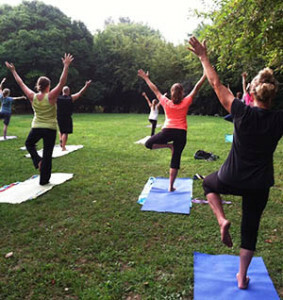 Vital Tree Yoga leads yoga classes every Sunday morning on the upper lawn of Flannigan Park (located on the corner or Front and Pine Streets in Marietta). Flannigan Park is also the home of the Marietta Market, an open air farmers market that offers fresh local produce, meat, cheese, bread, prepared food, coffee, flowers and features various local artists through out the season. ALL classes are for ALL levels of experience. Sundays from 8:00-9:00am beginning June 1st through September 28th (Weather permitting…).